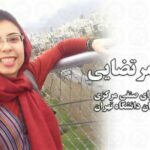 Human Rights Activists News Agency (HRANA) – Graduate student in humanities and Secretary of Tehran University Central Student Union Soha Mortezaei– who was among those arrested amid the 2018 “January protests”– has been sentenced to six years’ imprisonment and a two-year ban on membership in political parties, groups, and gatherings by Branch 26 of the Revolutionary Court of Tehran, presided by Judge Ahmadzadeh. Mortezaei’s name figured in HRANA’s January 6, 2018 report on citizens apprehended during the aforementioned protests, which gained countrywide momentum and were met with considerable violence form authorities. She was detained for her inquiries into the status and wellbeing of detained fellow students who had participated along with her in the demonstrations. Mortezaei had a previous run-in with authorities, in a wave of arrests that took place in January of 2015. She was arrested along with Amirkabir and Allameh Tabatabai University student activists Zahra Khandan, Fershteh Tusi, and Parastou Biranvand. One month later, she was released. The January Protests led to large number of arrests and interrogations across the country. While the protests began on December 29, 2017 in the city of Mashhad, the unrest quickly spread to other cities. Thousands were detained and at least 25 died in skirmishes between protesters and security forces.